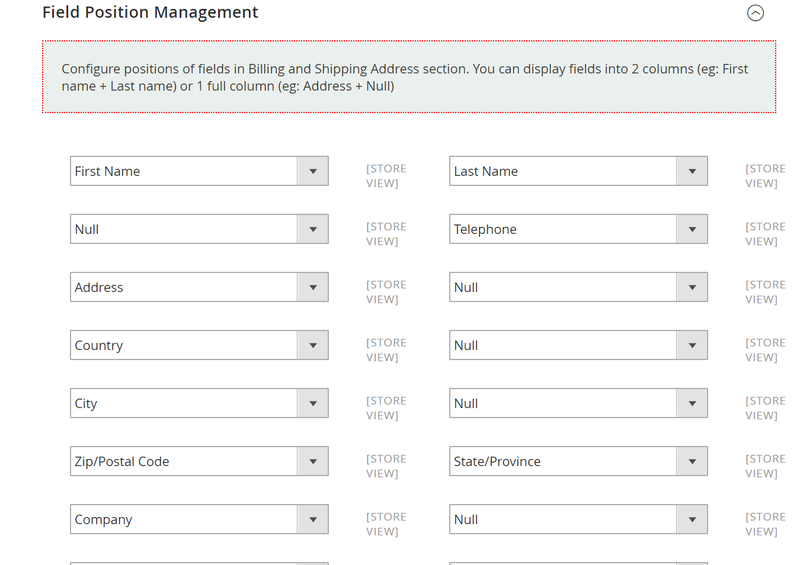 Magento 2 One Step Checkout Pro by Mage-World fastens checkout process by compacting all six steps checking out as normal into only one checkout page. The extension helps to avoid cart abandonment as well as increases customers satisfaction. 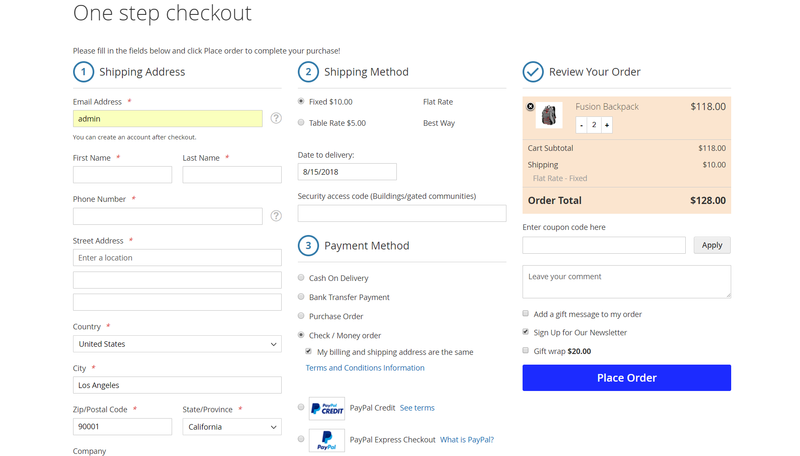 Normally, customers have to across six steps to complete the checkout session. With this extension, all required steps are displayed on one page so customers can checkout in an easy way without wasting time redirecting one by one. In addition, when customers find something they are interested in and add the product to cart, the system will redirect to the checkout page automatically. They will focus on their order that not distracted by anything or waste their time loading pages. The feature also minimizes cart abandonment and increases customer satisfaction as well. One Step Checkout for Magento 2 extension bases on a completely open-source platform so it is easy to edit or change something in the template that does not effect to other parts of the site. In frontend, this extension allows web owner to configure checkout page layout such as heading text color, place order button background, order summary or step number icon. Besides, other configurations can be customized easily. The smart Google address suggestion allows customers to fill their address information on the checkout page instantly. 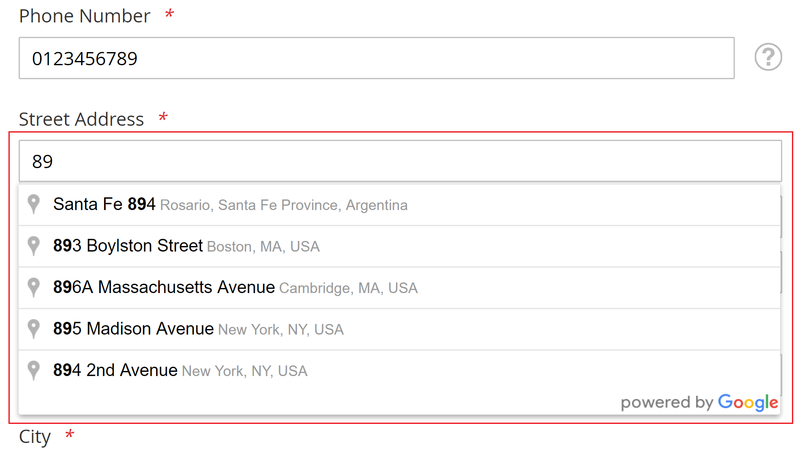 When customers enter the first characters a droplist will appear with address suggestion and customers may find their address there. Along with that, the module Geo IP betters the checkout process by suggesting locations based on customer's IP address. To registered members, they can easily complete filling shipping information because their data has been saved. There are different payment methods such as: cash on delivery, bank tranfer, payment services.. 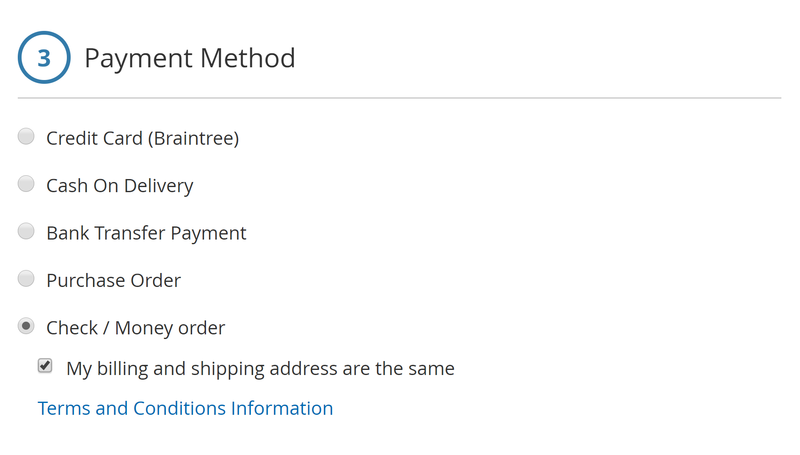 Moreover, other methods are compatible with the checkout: PayPal, Stripe, Amazon Pay, Braintree, Klarna, Paymentsense, Knet... Admins can manage and add payment methods that best convenient to them and their customers. Admins are allowed to arrange positions of feilds in Shipping Adress section. They can disable unimportant fields to bring the best performance from the site. The customers can choose gift wrap service to not waste their time buying a product, wrap it themselves then send the gift to their friend. The module solves gifting problems and merchants may gain more profit through gift wrap service. 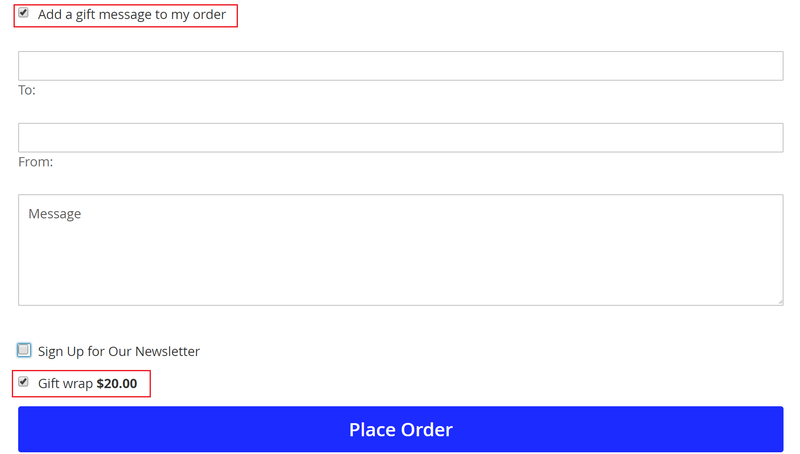 Customers can also send a message along with the gift by adding gift message to their order. Compatible with different themes such as Porto, Ultimo, etc. Supporter reply quickly for my requirement. review by Great support, good extension! Thank you MageWorld team for giving a good extension. This is the best One Step Checkout extension for Magento 2. I like your template, it is a modern interface. Thank MageWorld team! 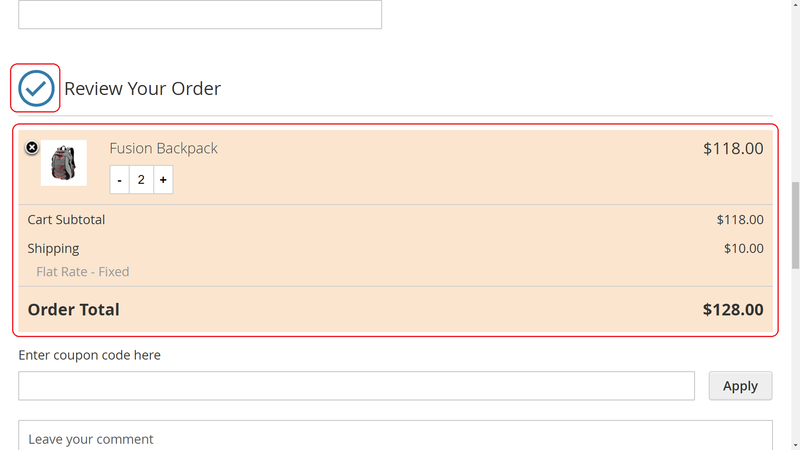 I am using One Step Checkout extension for my magento 2 site. It work well. I will recommend for my partners. Q. What kind of payment can work well with this extension? A. Every payment methods are compatible to the extension so you can add anyone you want to use. A. Definitely YES! Our extension is 100% open-source so you can freely customize it as the way you want. Otherwises, you can always use our professional customization service. Feel free to send us your request via (link) and we will make your ideas become real. Q. Is there any additional fee? A. You only have to pay one time for the extension, there is no extra fee. Q. Which edition does this One Step Checkout extension compatible with? A. The One Step Check Out extension for Magento 2 can suit both community and enterprise editions, 2.111.x and 2.2.x version. A. Our extension bases on Magento coding standard very closely so be assured to install the extension, it can be suitable on any custom theme or design that doesn't affect to them. If you have any problem, feel free to contact us, we're always available to support you. Q. Can I have a demo link to use before purchasing? A. We've already provide a demo site for trial, please follow this link. If you have any question, don't hesitate to ask us anything.